I've been absent since Christmas time, due to the busy preparations and trip my husband and I made to Algeria. He is French, of Algerian descent, and hadn't been back to see his family for almost thirty years. Just imagine with over forty cousins how many dinner invitations we had in three weeks... I'd like to share with you just a few of the traditional dishes I tasted. 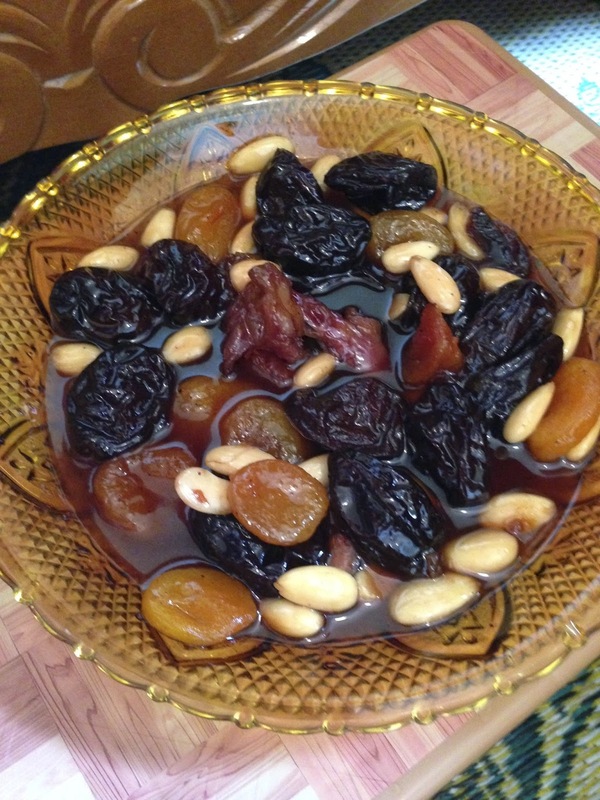 This is a sweet dish made from a strip of lamb meat, cinnamon stick, prunes, dried apricots, almonds, and orange blossom water. L'ayn is a holiday dish served during ramadan to break fasting. People don't usually eat the meat. They eat the fruits at the beginning of the meal, like they would eat dates and milk, before moving on to Chorba (the soup). 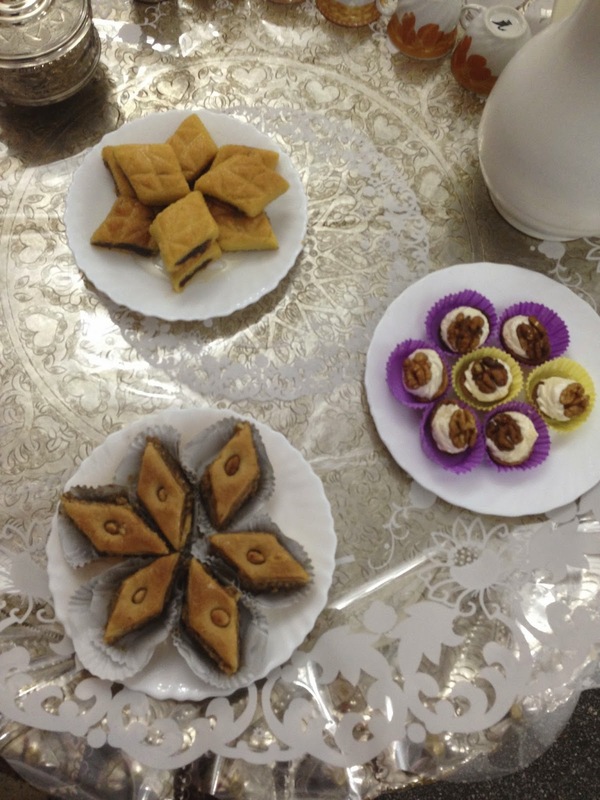 We weren't there during ramadan, but they made a lot of special dishes for us anyway :) Thank you Souad. 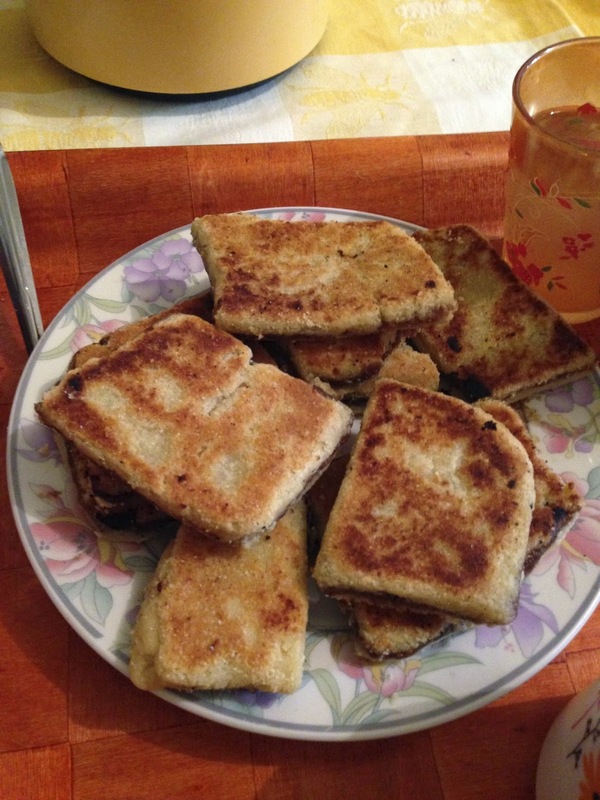 In the region of Constantine they are known for making a good chakhchoukha (pronounced sho-shor-ha). Women start by making a flat bread out of wheat semolina, as shown in large triangular pieces on the table in the next photo. They pinch off little bits of it, and let them dry out. They keep this stored in the cupboard. To make the dish, they wet the pieces, steam them twice, butter them, then cover and simmer with a meat and tomato broth until the liquid evaporates. Thank you Nassera for this wonderful meal. 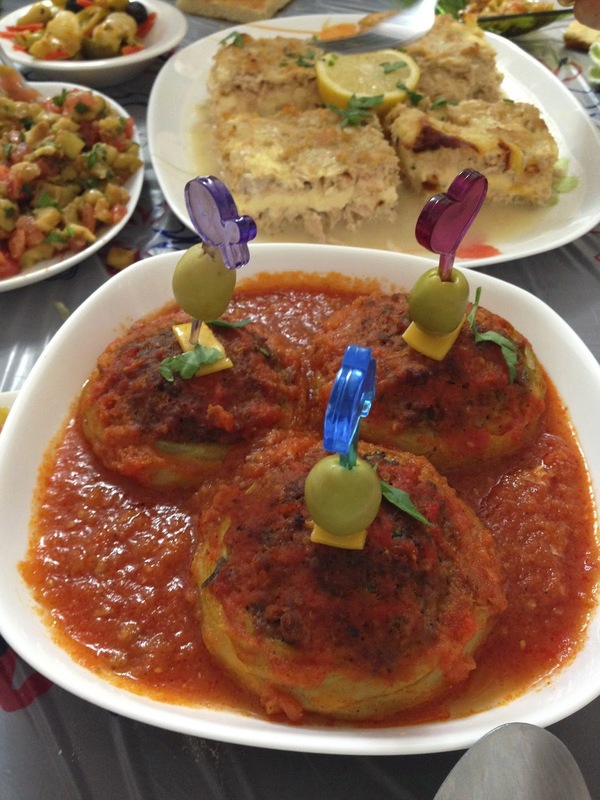 This impeccably presented dish is made of artichoke hearts with a ground meat stuffing, in a tomato sauce. This is just one of the wonderful dishes my friend Sarah made for me at this meal. Thank you Sarah. I'm sure you are all familiar with Baklava. It's the dessert on the bottom lefthand corner. This is one of the best baklavas in my memory, made with rosewater, by Djawida's mother for a wedding party. The Makrout (top left) are similar to the braj, but they are baked instead of pan fried, and are then soaked in a honey and orange blossom water syrup. The walnut mousse cups are reminiscent of another traditional walnut cookie not fancy enough to make it into the wedding party. Braj is a simple dessert, made through out spring time. They use a wheat semolina dough for the outside, and fill the inside with a date paste called elgherss. The patties are cut and browned in a pan. Thank you Aziza and Zhora for sharing these with us.